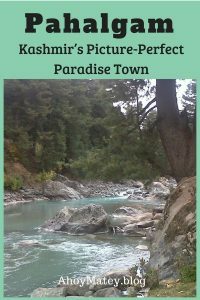 Growing up in India, Pahalgam represented all that was charming about Kashmir – a Paradise where many a Bollywood movie was filmed in the 1970s. The closest we got to this town was on our TV screens, when Amitabh Bachan romanced Rekha, in the song ‘Dekha Ek Khwab’ from the movie Silsila (1981), which was partly shot along the rivers and valleys of Pahalgam. 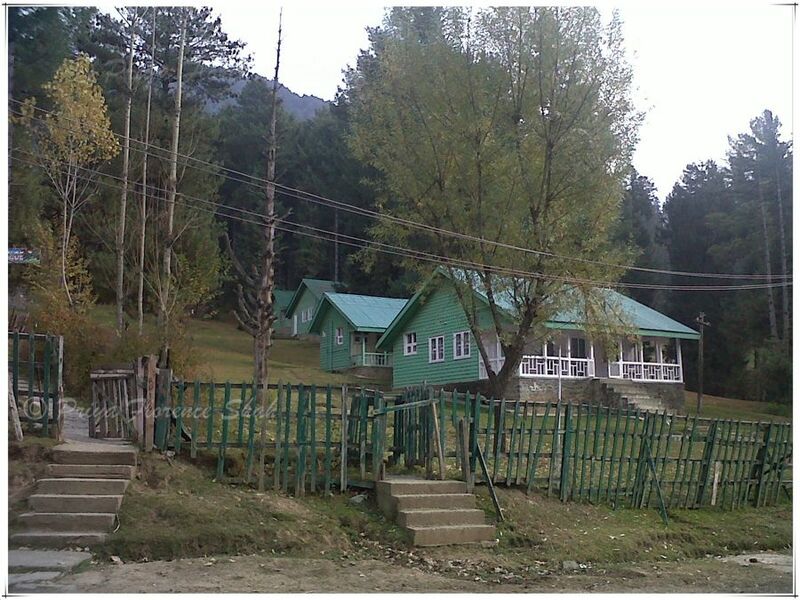 Filmmaker Vidhu Vinod Chopra’s thriller Khamosh (1985) starring Shabana Azmi, was also set mostly in Pahalgam. This picturesque town set amidst pine forests on the banks of the Lidder river is the kind of movie locale that rivals Switzerland in Bollywood’s playbook. 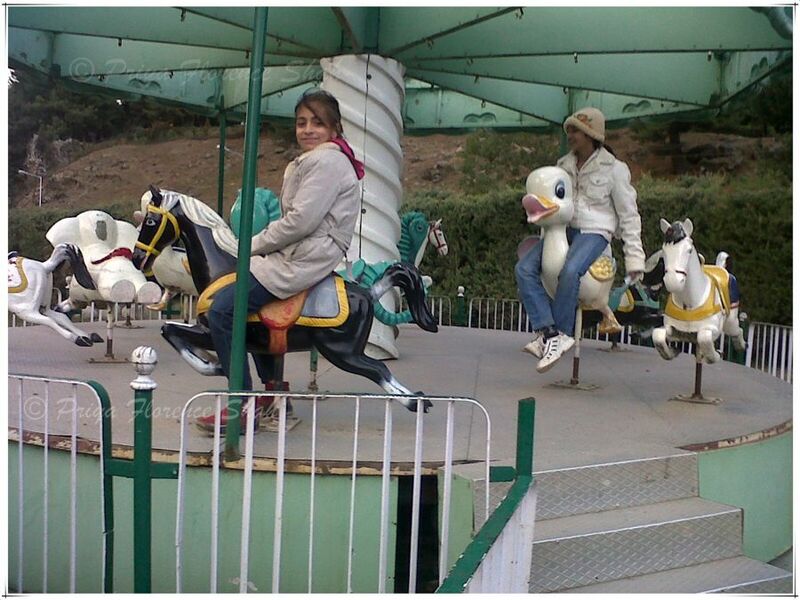 When we took our trip to Kashmir in October 2011, it was definitely on our itinerary. 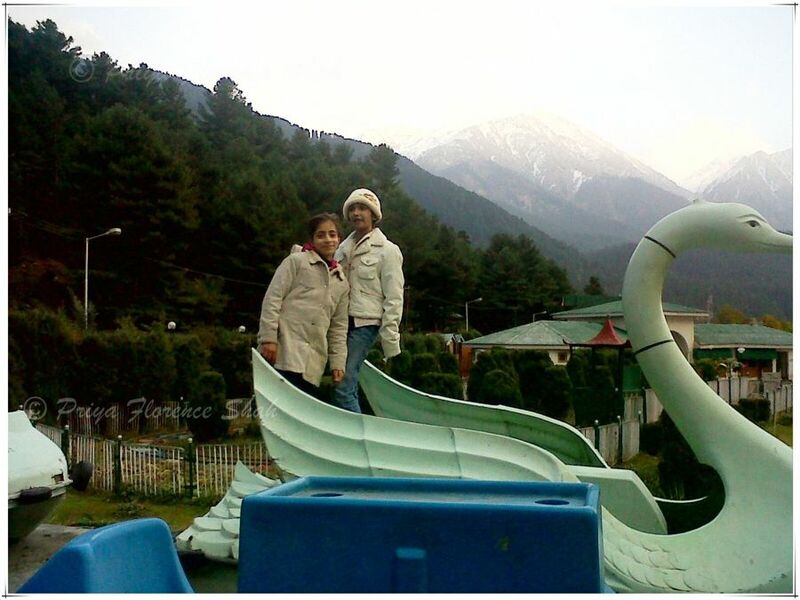 On our 10-day trip, Pahalgam was one of the places where we spent 2 nights, and even that, I felt, was too short. 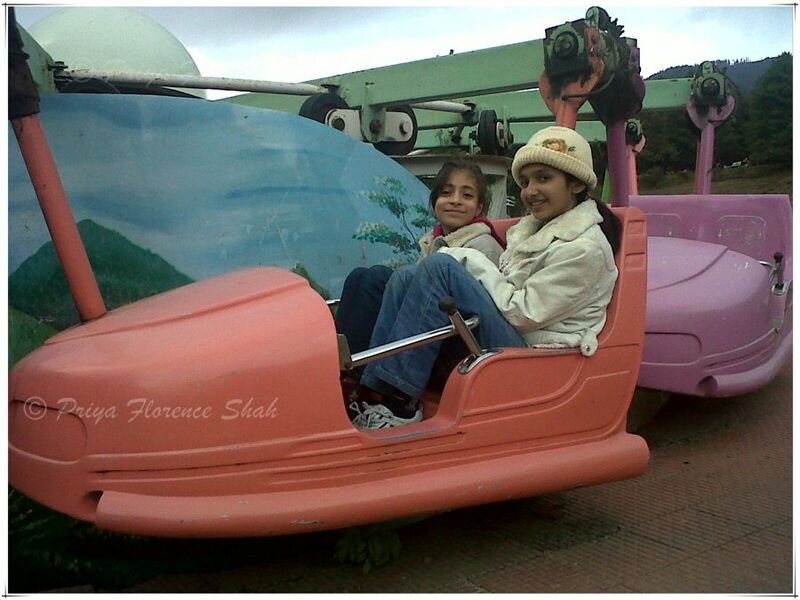 Not only was the town as picture-perfect and charming as it looked in the movies, but the kids had a lot of fun there. The main street in the town is a road where you’ll find the few shops and a small cafe. 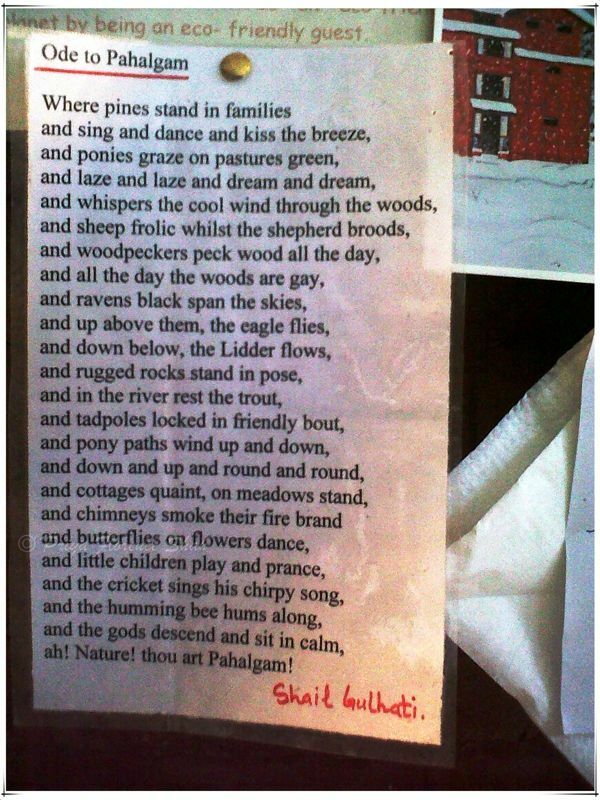 The coffee shop had, among other historical images and paraphernalia, this lovely ode to Pahalgam, written by a bard called Shail Gulhati, that describes the town perfectly. 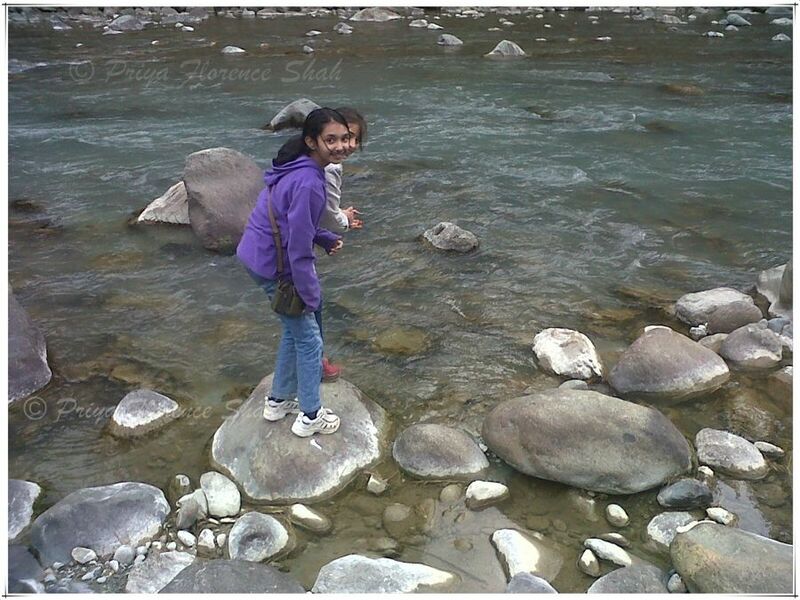 My fondest memories of Pahalgam are that of our excursion along the banks of the picturesque Lidder river that originates from the Kolhoi Glacier and joins the Jehlum River at Mirgund Khanabal. The kids had so much fun exploring the banks, we could have stayed all day. Our driver and guide, Parvaiz bhai – whose daughter, Maleha had joined us for the trip – found us a cosy cottage to sleep for two nights. We spent the cold evenings huddled up under the covers, kept warm and toasty by the thermal blanket I had bought in Srinagar, watching television shows like Kaun Banega Crorepati, India’s version of Who Will Become a Millionaire. The kids went for a pony ride in the morning (I have bad knees and don’t like riding animals), while Parvaiz bhai and I chatted about life and other things over a steaming cup of Kashmiri kahwah. 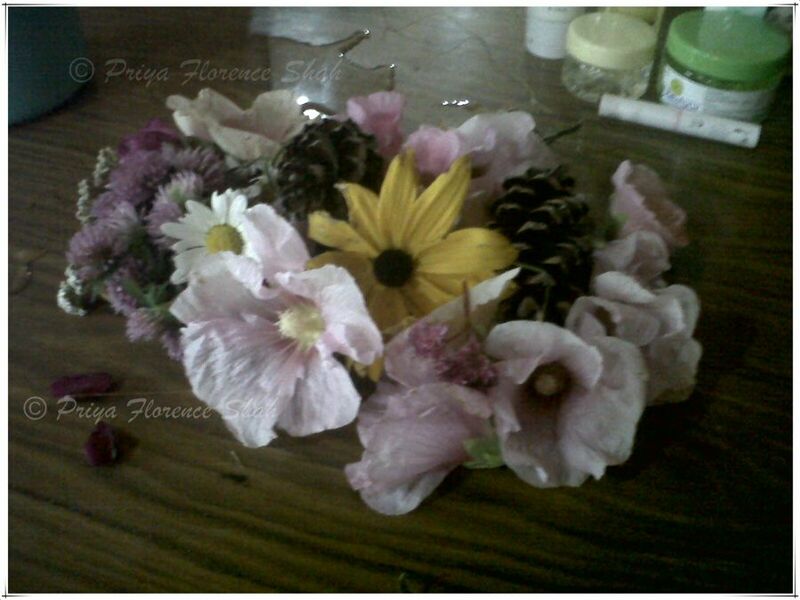 I was touched when the kids brought back a bunch of pretty wildflowers and pine cones for me. Another excursion we enjoyed was a visit to the Lidder View amusement park. 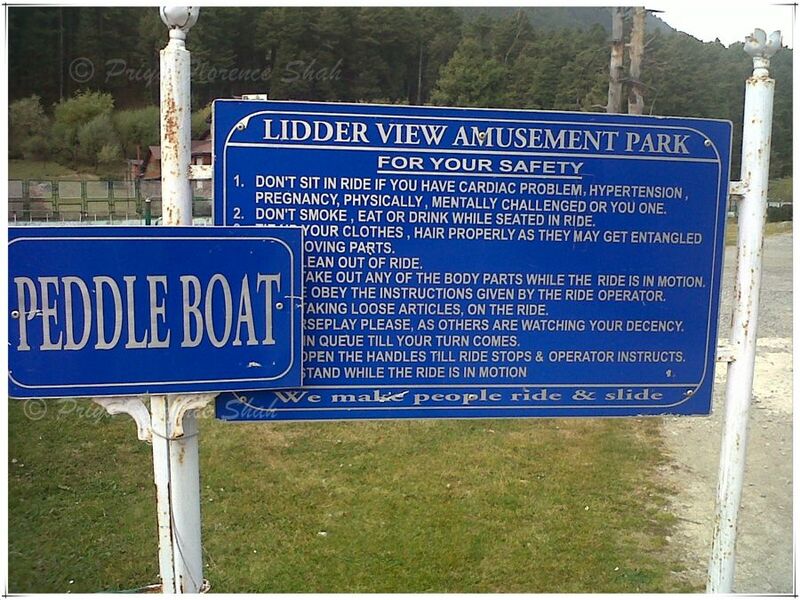 Lidder View Amusement Park – peddle what? The park was closed, but Parvaiz bhai persuaded the man at the gate to let us in. Even though it was shut down, the kids enjoyed a game of pretend on the rides. 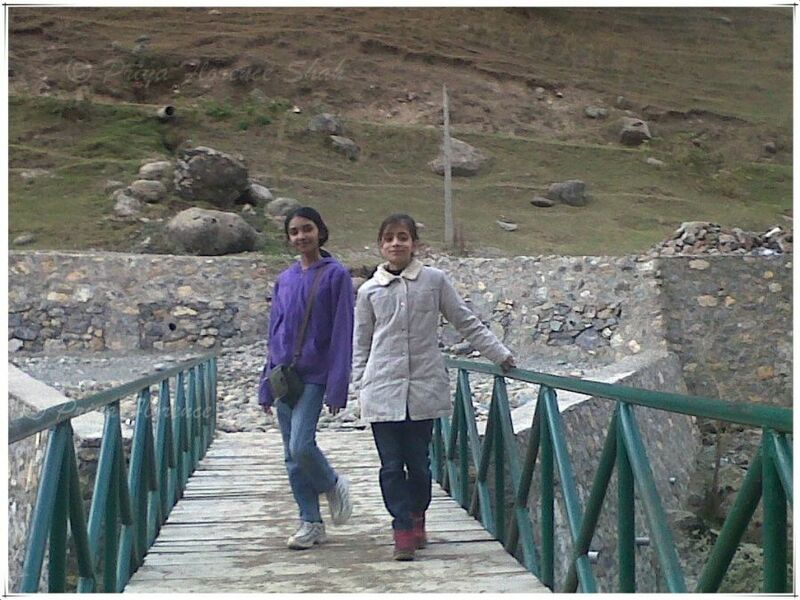 As far as travel destinations go, I found Pahalgam a sleepy, lovely and quiet place for a vacation. There were no crowds when we went, just locals going about their business. Depending on the time of year you go to Pahalgam, there are many more activities that you can opt for, such as golf, fishing (permits required), pony rides, trekking, camping and skiing. As I’ve been told, the situation in Kashmir is slowly returning back to normal. 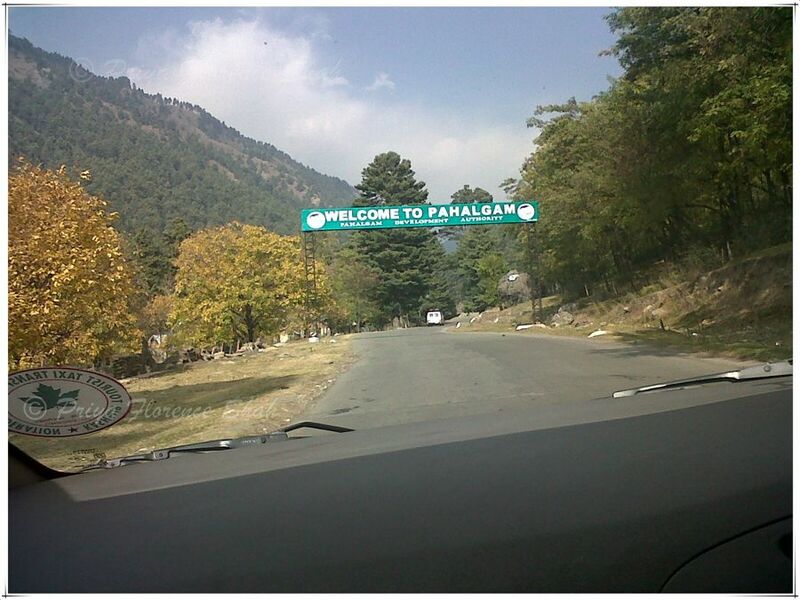 If that continues, who knows, I might just be able to visit Pahalgam once again. 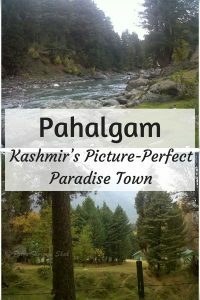 Watch my video of Pahalgam, Kashmir, starring my own Kashmir ki kalis. It looks even more beautiful in winter with snow on the ground, Kristie. I haven’t been that late in the year, but hope to go again sometime. 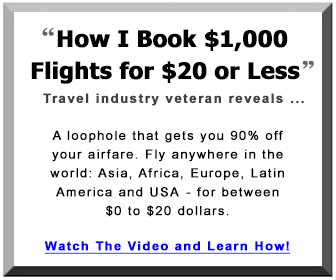 This looks like a fantastic place to visit. I hadn’t heard of Kashmir before reading this post and didn’t realize how popular is was in Bollywood movies. The scenery looks very lovely and I’m glad you got to visit this after all. Maybe next time you will have a longer visit! I really hope I get to stay there longer the next time I go, Sara. What a really interesting area! I know nothing of India, and have seen 2 seconds of a bollywood film, so it’s cool to know about the connection there! The family clearly had a good time too! Yes, it’s one of the loveliest places we’ve been to. It’s a wonderful place to relax. Like a little Swiss village. Traveling with the whole family can be tricky but I am happy to hear that you found a lovely place to spend some relaxing time. 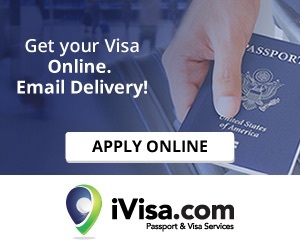 It’s not hard to find good family accommodation in India. We are big on family travel here. 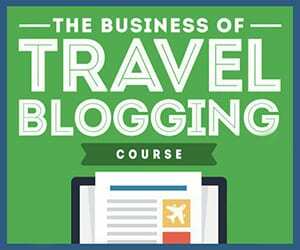 Priya, such a nice blog post! I have been dreaming of going to Kashmir for a while but obviously I don’t have all the references you do (btw, thanks for Chopra’s thriller Khamosh (1985) citation, will make sure to watch some day). Is it safe today? What you think? Patricia, I was told by Divya Thani, the editor of Conde Nast Traveller, who just visited Kashmir, that it’s quite safe to visit. I’m inclined to believe that also because there have been no recent reports of violence or terror in the area. Kashmir is gorgeous. Lidder River is such a green glacial river and I remember when we visited, its exactly what my parents were telling me – that so many movies have been shot here. 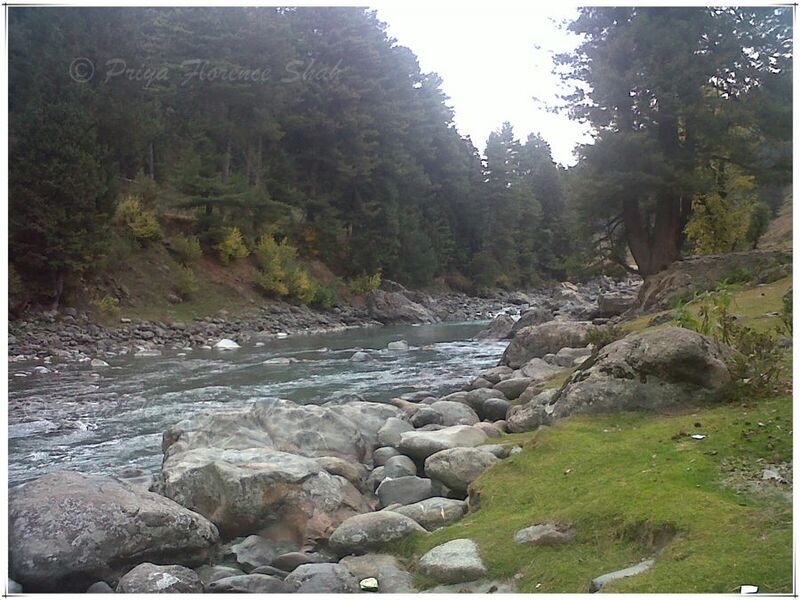 We also visited this valley called Betaab Valley which was named so because of the movie ‘Betaab’ being shot here! I am not surprised, it’s so gorgeous, so romantic and magical! Yes, it is, Medha. 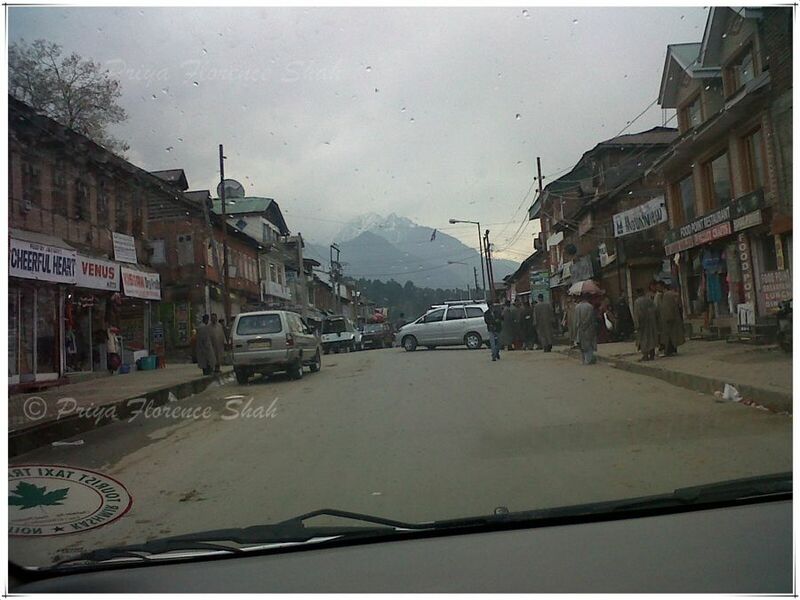 I’m hoping to go back to Pahalgam someday and stay for longer this time. 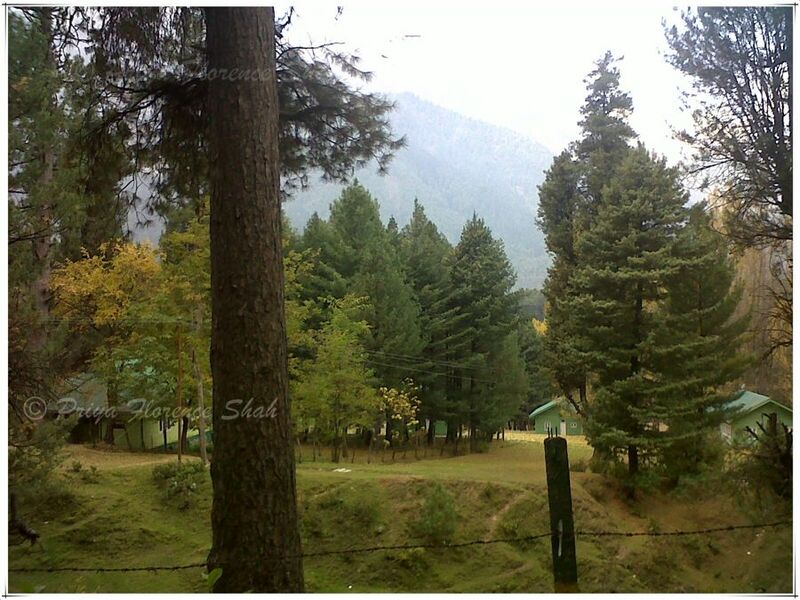 Kashmir is real paradise on earth. I felt so emotional reading this post. I spent 4 years of my childhood in Kashmir. Those were the most beautiful days. I want to go to that place again. I don’t know, how Kashmir is now but those were really good days. Thanks for sharing. Amazing and how lucky to have spent 4 years in Kashmir, Gurimrat. It truly is heaven on earth.